Welcome to Reason No. 1,276,385 that the NFL needs to check itself before it wrecks itself. Last Thursday night is a perfect example of what’s wrong with, well, Thursday night. As much as fans selfishly enjoy having another primetime game to watch, the players are wholeheartedly opposed to this potentially jarring speedbump in their schedule. All the while, the league can’t seem to stop from tripping over its own two cleats. In an otherwise meaningless NFC West battle between the banged-up Seattle Seahawks and the even more banged up Arizona Cardinals, the team who we thought would win the game did. That victory, however, came at quite a cost. 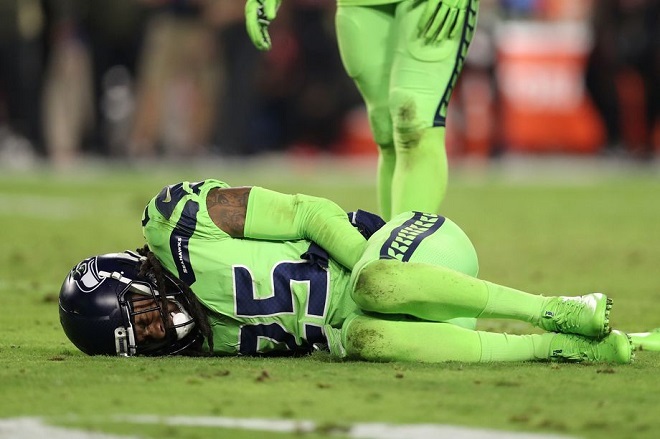 Defensive face of the franchise Richard Sherman was lost to an Achilles tendon tear. He will miss the rest of the season. Seattle’s offensive face of the franchise also got dinged-up. Star quarterback Russell Wilson took a healthy helmet to the chin and was forced to miss a down. He probably should have sat out for more than one play. As is the rule established to protect the health of its players, all those who take a hit to the head must go through concussion protocol before returning to the game. Wilson, however, waved off team doctors and got back on the field the very next play he could. The league is now looking into how Seattle handled the Wilson situation to determine whether they broke league rules by not keeping him out until he was medically cleared to play. Therein lies the hypocrisy of the league: they put their players in riskier than normal situations then penalize them for not following protocol. Oh, the devious irony. The league now looks like it may embark on a witch hunt of another one of its top teams and top quarterbacks all because he wanted to compete. Sound familiar? Meanwhile, the league parades its relatively ho-hum Thursday night match-ups as a tasty appetizer for the week to come, albeit one the players cannot stand to be a part of. While Thursdays haven’t necessarily replaced the far more traditional Monday Night Football in terms of popularity, millions of fans still watch. Monday, however, is only one day off teams’ normal schedules. Thursday games means teams barely have time to recover from the Sunday they just played. This turn-around time is particularly hard on league veterans. Statistically speaking, it is impossible to tell whether Thursdays see more injuries. Even if these statistics were released, the NFL would doctor them in their favor anyhow. With concussions piling up every week, however, the league can hardly be seen as pro-Thursdays if it ever came out that these games put their players in considerably more jeopardy. So, the league finds itself in yet another quagmire. To Thursday or not to Thursday: that is the question. We’ll see if anyone in the front office has any semblance of an answer. I’m not too sure their track record means they’ll come up one. This entry was posted in Featured, Pigskin and tagged Arizona Cardinals, New England Patriots, NFL, Richard Sherman, Russell Wilson, Seattle Seahawks, Tom Brady by Chris Humpherys. Bookmark the permalink. Don’t watch Thursday games anyway. Only watch Sunday games if a few games are interesting, Hell, I’ll watch the Gators before I tune into a Seahawks / Cardinals game these days. Negative press and parity (if you want to call it that) will do that. Just glad Bama escaped this weekend. As Funny Maine would say, anyone play linebacker…anyone?…High school will count at this point. Glad to see you are back at the keyboard – I was beginning to worry about you. Have some things in the works, just have been busy as all hell. I’ll tell you one thing. Watching Mississippi State-Bama on Saturday gave this Gator fan renewed interested in Dan Mullen as our head coach. Colorful uniforms and then we had the collective week ten displays of Dak Prescott and Eli Manning. I haven’t seen that many hits taken since my godson unleashed his wrath on a pinata . John Schnatter of Papa Johns apologizing for his lame @ss remarks aimed at fans , specifically African American supporters of Colin Kaepernick. Will there come a time when those @ssholes along with the Imbecile Chief (Donald Trump) will actually get a fuc#ing clue ? Donald Trump arranges for the release of Jalen Hill , Cody Riley and LiAngelo Ball , brother of Lonzo Ball of the Lakers , who were arrested having stolen items from three stores in Beijing China while the Bruins were vising the country. The US President has alleged their actions weren’t that serious and he interceded in seeking their release from the Chinese authorities after their arrest. The UCLA Bruins’ program is a fu#king joke along with Steve Alford and Donald Trump. The NFL wants parity, Al. That’s what it’s got. At least we have refreshing young teams like Philadelphia and Los Angeles to watch. Still somehow makes it all worthwhile. Jameis Winston is now under investigation for groping a female Uber driver ? Tell me it was done , because he was dissatisfied with her service ? LOL,LOL,LOL !!!!! What we’re now seeing in the NFL isn’t parity , but mediocrity in terms of the coaching and also the on-field talent. Anyone believing this represents parity is sadly mistaken .